“Origami Ikebana” by Benjamin John Coleman is the second product by that author that I am reviewing. I wrote a review on Coleman’s “Origami Bonsai” kit about a year ago (review can be read here). Coleman’s new book/DVD, “Origami Ikebana” is just what you’d expect based on his last publication, Origami Bonsai. 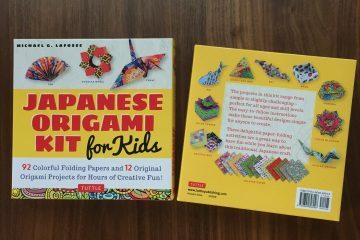 Although the actual ikebana and bonsai are two different forms of art, these two products by Coleman cover pretty much the same topic: how to create realistic origami flower sculptures. However, the Origami Ikebana is a more recent product than the Origami Bonsai so I see a lot of improvements and greater depth in the newer book. What are the improvements, you may ask? 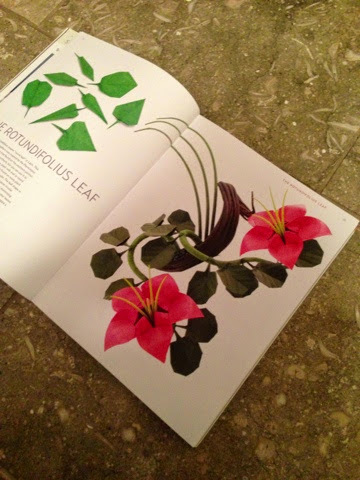 First of all, there is a wider variety of flower and leaf instructions offered in the new book. His new book has 8 types of leaf models and 34 types of flower models, whereas the old one had 4 types of leaves and 6 types of flowers. What’s even more exciting is that the author explains how to cut paper into decagon and dodecagon, which allows you to fold 5-petal flower and 6-petal flower respectively. Previously in Origami Bonsai, every flower model had four petals. By cutting paper into decagon or dodecagon, each included flower model could have more petals. This opens up a whole new set of possibilities, and I look forward to not only folding his flower models but also experimenting with decagon and dodecagon for my own models. 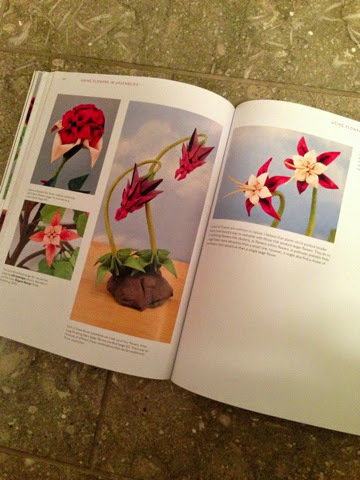 Furthermore, the author gives step-by-step detailed instructions with photos on painting leaves and flowers, making base rocks and boulders, painting them, rolling paper for stems and stamens, assembling the parts for a finished sculpture, and even packing it for shipping. 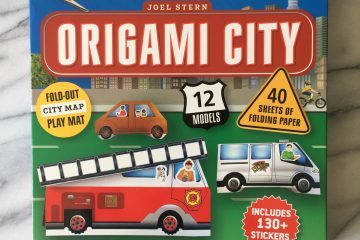 Indeed, it is A LOT more than just an origami instructional book! To tell the truth, I am usually hesitant to do messy projects so I haven’t tried painting paper, making rocks or rolling paper, but his examples in the book all look beautiful so I plan to try it someday. By far, this flower sculpture example is my favorite! 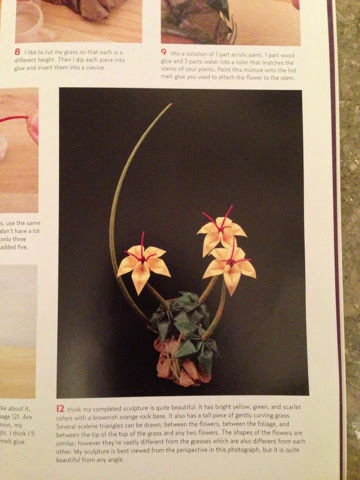 Overall, I am very impressed by both the quality and quantity of the content in Origami Ikebana. The entire book is filled with beautiful examples, in full-color and even comes with a DVD! 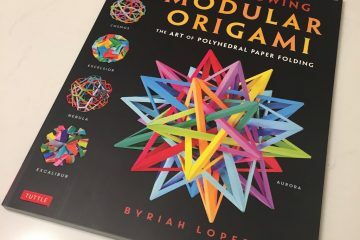 I think that any origami enthusiast would enjoy this book, but especially those who like to go a step further than just folding and to find ways to sculpt the model for a beautiful display, as well as to experiment with their own folding patterns. If that sounds like what you like to do, this book is for you!